Autism is a severely incapacitating developmental disorder of brain function characterized by three major types of symptoms: impaired social interaction, problems with verbal and nonverbal communication, and unusual or severely limited activities and interests. Autism is a complex developmental disability with symptoms that typically appear during the first three years of childhood and continue throughout life. It is the most severe disorder within a group of developmental disorders called autism spectrum disorders (ASDs) or pervasive developmental disorders (PDDs) that cover a wide range of behaviors and symptoms, all related to a lesser or greater extent to impaired social and communication skills . In its most severe form, autism may include extreme self-injurious, repetitive, highly unusual, and aggressive behaviors. According to the Center for Disease Control and Prevention, PDDs were estimated to occur in two to six per 1,000 births in 2003 with autism being the most common PDD, affecting an estimated one in 250 births. As of 2004, as many as 1.5 million Americans are were believed to have some form of autism. The disorder is four times more prevalent in boys than girls and is not associated with any specific racial or ethnic background. Family income, lifestyle, and educational levels also do not affect the chance of the disorder's occurrence. The Autism Society of America (ASA) warns that autism is on the rise. Based on statistics from the U.S. Department of Education and other governmental agencies, the ASA estimates that the disorder is growing at a rate of 10 to 17 percent per year, which could lead to 4 million Americans being affected by autism between 2005 and 2015. While understanding of autism grew tremendously since it was first described by Leo Kanner in 1943, no known single cause for autism as of 2004 was yet identified, although research has shown that it results from specific abnormalities in brain structure or function. For example, brain scans show that the shape and structure of the brain in autistic children are different from those of non-autistic children. Researchers investigated several theories and established a firm link between heredity, genetics, and medical problems, while also establishing that no known psychological factors in the development of the child have been shown to cause autism. The genetic link is supported by observations showing that, in many families, there seems to be a pattern of autism or ASDs. While no one gene was identified as causing autism as of 2004, researchers are searching for irregular segments of genetic code that autistic children may have inherited. Autism has also been shown to occur more frequently among individuals who have certain medical> conditions, including> fragile X syndrome, tuberous sclerosis , congenital rubella syndrome, and untreated phenylketonuria . Toxins and pollution in the environment have also been associated with autism. The Center for the Study of Autism and other agencies documented a high prevalence of autism in certain communities, for example, in the small town of Leomenster, Massachusetts, and in Brick Township, New Jersey, and attempted to uncover the reason. The characteristic behaviors of autism may or may not be apparent in infancy (18 to 24 months) but usually become obvious during early childhood (two to six years). The presence of any of these five behaviors does not mean that a child has autism, but because the characteristics of the disorder vary so much, a child should be evaluated by a multidisciplinary team that may include a neurologist, psychologist, developmental pediatrician, speech/language therapist, learning consultant, or other professionals knowledgeable about autism. Childhood Autism Rating Scale (CARS). CARS is based on observed behavior. Using a 15-point scale, professionals evaluate a child's relationship to people, body use, adaptation to change, listening response, and verbal communication. Checklist for Autism in Toddlers (CHAT). CHAT is used to screen for autism at 18 months of age. The screening tool uses a short questionnaire with two sections, one prepared by the parents, the other by the child's family doctor or pediatrician. Autism Screening Questionnaire (ASQ). The ASQ is a 40-item screening scale used with children four and older to help evaluate communication skills and social functioning. Screening Test for Autism in Two-Year Olds. This test uses direct observations to study behavioral features in children under two. It is focused on three skills areas, play, motor imitation, and joint attention, that are associated with autism. There is as of 2004 no cure for autism, but appropriate treatment may promote relatively normal development and lower the incidence of undesirable behaviors. Doctors also may prescribe a variety of drugs to reduce the symptoms of autism, such as antidepressants and tranquilizers. Educational/behavioral therapies emphasize highly structured and often intensive skill-oriented training, and they are comparatively the most effective treatments available. The importance of early treatment is well established among professionals. Researchers have proposed that there is a critical period during which the young, developing brain is highly modifiable. For some children with autism, the repeated, active interaction provided by intensive educational/behavioral therapy may modify their neural circuitry before it goes too much awry, correcting it before autism becomes permanent. A wide spectrum of educational/behavioral therapies were developed during the last decades of the twentieth century under the umbrella of applied behavior analysis (ABA), the science of human behavior. ABA is the process of systematically applying interventions based upon the principles of learning theory to improve socially significant behaviors to a meaningful degree. ABA methods treat autism with particular strategies: using reinforcement procedures to increase on-task behavior and social interactions; teaching new skills (functional life skills, communication skills, or social skills); maintaining desirable behaviors (teaching self-control and self-monitoring procedures to maintain social skills); transferring behavior from one situation or response to another (from completing assignments in the resource room to performing as well in the mainstream classroom); reducing interfering behaviors (e.g., self-injury). The Miller Method. Developed at the Language and Cognitive Development Center (LCDC) in Boston, MA. The LCDC is a Massachusetts Chapter 766-approved day school, serving students with autism or PDD ages three to 14. The LCDC specializes in a particular approach to teaching children with autism. The Miller Method extensively uses adaptive equipment, including platforms (to elevate the child so as to help increase eye contact), large swinging balls (to expand the child's reality system) and Swiss cheese boards (to teach motor planning, as well as to increase the child's understanding of his or her relation to environment and space). 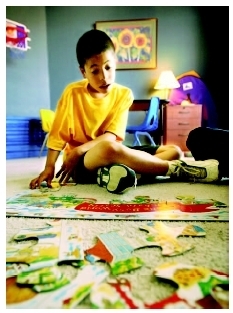 Therapy for autistic children may include working on jigsaw puzzles. child then builds upon the mastered skill toward a more complex one. Treatment and Education of Autistic and Communication Handicapped Children (TEACCH). TEACCH is a statewide program in North Carolina that tries to respond to the needs of autistic people by using the best available approaches and methods. The TEACCH approach includes a focus on the person with autism and development of a program around this person's skills, interests, and needs. The major priorities include centering on the individual, understanding autism, adopting appropriate adaptations, and a broadly based intervention strategy building on existing skills and interests. The Son-Rise program. The Son-Rise program was created by Barry and Samahria Lyte Kaufman in the 1970s, as a means to teach their own son, who was diagnosed with autism and mental retardation . The program ranges from one week to six months and is designed to teach parents, professionals, and support staff of children with a wide range of disabilities how to implement home-based programs based upon the Kaufmans' theories of learning. There have been no studies of the Son-Rise Program's effectiveness, and the method has not been subjected to scientific evaluation. Megavitamin therapy. Some studies have shown that vitamin B 6 improves eye contact and speech and lessens tantrum behavior. Vitamin B 6 causes fewer side effects than other medications and is considered safe when used in appropriate doses. However, not many health practitioners advocate its use in the treatment of autism, citing that the studies showing its benefit were flawed. Dimethylglycine (DMG) is a compound available in many health food stores, that is legally classified as a food, not a vitamin or drug. Some researchers claim that it improves speech in children with autism. Those who respond to this treatment usually do so within a week. Many doctors, however, do not feel that the studies are adequate to promote DMG in the diet of autistic individuals. People with autism have normal life expectancies. Symptoms in many children improve with treatment, or as the children grow up, some eventually are able to lead normal or near-normal lives. Adolescence can worsen behavior problems in some children, and treatment should be adjusted for the child's changing needs. According to the National Institute of Neurological Disorders and Stroke (NINDS), about one third of children with ASDs eventually develop epilepsy. The risk is highest in children with severe cognitive impairment and motor deficits. Since the cause of the brain anomalies associated with autism is not known, prevention is not possible. Congenital rubella syndrome (CRS) —Viral illness caused by a togavirus of the genus Rubivirus. When rubella infection occurs during pregnancy, fetal infection is likely and often causes congenital rubella syndrome (CRS), resulting in miscarriages, stillbirths, and severe birth defects. Up to 20 percent of the infants born to mothers infected during the first half of pregnancy have CRS. The most common congenital defects are cataracts, heart disease, deafness, and mental retardation. Fragile X syndrome —A genetic condition related to the X chromosome that affects mental, physical, and sensory development. It is the most common form of inherited mental retardation. Pervasive developmental disorder —A category of childhood disorder that includes Asperger syndrome and Rett's disorder. The PDDs are sometimes referred to collectively as autistic spectrum disorders. Phenylketonuria (PKU) —A rare, inherited, metabolic disorder in which the enzyme necessary to break down and use phenylalanine, an amino acid necessary for normal growth and development, is lacking. As a result, phenylalanine builds up in the body causing mental retardation and other neurological problems. Tranquilizer —A medication that has a calming effect and is used to treat anxiety and mental tension. Tuberous sclerosis —A genetic condition that affects many organ systems including the brain, skin, heart, eyes, and lungs. Benign (non-cancerous) growths or tumors called hamartomas form in various parts of the body, disrupting their normal function. Be informed. Parents should learn as much as they can about autism so that they can be involved in determining care. Be prepared. Parents should prepare for meetings with doctors, therapists, and school personnel. They should ask questions and communicate their concerns regarding treatment issues and the impact of the diagnosis on the family. Be organized. Many parents find it useful to keep a notebook detailing their child's diagnosis, treatment, and the meetings they have with professionals. Communicate effectively. Open communication is very important. If parents disagree with a professional's recommendation, for example, they should communicate specifically why they disagree. See also Fragile X syndrome ; Pervasive developmental disorders ; Phenylketonuria . Barron, Judy, and Sean Barron. There's a Boy in Here. Arlington, TX: Future Horizons, 2002. Boushey, Ann. Parent to Parent: Information and Inspiration for Parents Dealing with Autism and Asperger's Syndrome. Herndon, VA: Jessica Kingsley Publishers, 2004. Buten, Howard. Through the Glass Wall: Journeys into the Closed-off Worlds of the Autistic. New York: Bantam Books, 2005. Coleman, Mary. The Neurology of Autism. Oxford, UK: Oxford University Press, 2005. Griffin, Elizabeth. Fragile X, Fragile Hope: Finding Joy in Parenting a Special Needs Child. Lynnwood, WA: Emerald Books, 2004. Hamilton, Lynn M. Facing Autism: Giving Parents Reasons for Hope and Guidance for Help. New York: Waterbrook Press, 2000. Harris, Sandra L., and Lara Delmolino. Motivating People with Autism Spectrum Disorders to Learn and Gain Independence. Bethesda, MD: Woodbine House, 2004. Barrett, S., et al. "Children on the borderlands of autism: differential characteristics in social, imaginative, communicative, and repetitive behavior domains." Autism 8, no. 1 (March 2004): 61–87. Lord, C., et al. "Regression and word loss in autistic spectrum disorders." Journal of Child Psychology and Psychiatry 45, no. 5 (July 2004): 936–55. Lewis, W. "Play and language in children with autism." Autism 7, no. 4 (December 2003): 391–99. Muhle, R., et al. "The genetics of autism." Journal of Pediatrics 113, no. 5 (May 2004): 472–86. Nader, R., et al. "Expression of pain in children with autism." Clinical Journal of Pain 20, no. 2 (March-April 2004): 88–97. Pinto-Martin, J., and S. E. Levy. "Early Diagnosis of Autism Spectrum Disorders." Current Treatment Options in Neurology 6, no. 5 (September 2004): 391–400. Whitaker, P. "Supporting families of preschool children with autism: what parents want and what helps." Autism 6, no. 4 (December 2002): 411–16. Williams, K. R., and J. G. Wishart. "The Son-Rise Program intervention for autism: an investigation into family experiences." Journal of Intellectual Disabilities Research 47, Pt. 4–5 (May-June 2003): 291–99. Association for Science in Autism Treatment (ASAT). PO Box 7468, Portland, ME 04112–7468. Web site: http://www.asatonline.org. Autism Network International (ANI). PO Box 35448, Syracuse, NY 13235–5448. Web site: http://ani.autistics.org. Autism Research Institute (ARI). 4182 Adams Ave., San Diego, CA 92116. Web site: http://www.autismresearchinstitute.com. Autism Society of America. 7910 Woodmont Avenue, Suite 300, Bethesda, MD 20814–3067. Web site: http://www.autism-society.org. Families for Early Autism Treatment. PO Box 255722, Sacramento, CA 95865–5722. Web site: http://www.feat.org. MAAP Services for Autism, Asperger's, and PDD. PO Box 524, Crown Point, IN 46308. Web site: http://www.maapservices.org. National Alliance for Autism Research (NAAR). 99 Wall Street, Research Park, Princeton, NJ 08540. Web site: http://www.naar.org. National Autism Hotline. Autism Services Center, 605 Ninth St., Huntington, WV 25710. Web site: http://..
National Institute of Child Health and Human Development (NICHD). 31 Center Drive, Rm. 2A32, MSC 2425, Bethesda, MD 20892–2425. Web site: http://www.nichd.nih.gov. National Institute of Mental Health (NIMH). 6001 Executive Blvd., Rm. 8184, MSC 9663, Bethesda, MD 20892–9663. Web site: http://www.nimh.nih.gov. I'm wondering if there are any studies that look at the age of parents when the autistic child is born. Looking at maternal age for autistic children versus maternal age for the population as a whole it looks as though the longer people wait before having children the more likely they are to have an autistic child (but also the more likely to have a Down's child and possible other problems too). Are there any studies that look at this issue? Yes there is I've been doing research on autism and its been said that the older the mother and father the more likely they are to have a child with autism.